First blush at this, but as I think about the priorities for civic deisgn type engagements that could happen in European countries, it is quite different from those of the USA. In the US for Design for Democracy, election design was the first strong foray into a systematic and scaled engagement between the design community and government. Althought there was an early project on transportation design with the DOT. The focus on Election Design makes sense when one considers the US presidential system, in which citizens directly vote for candidates and often propositions, which in turn makes (1) voting more complicated than in Europe, thus requiring design to clarify and simplify the information; and (2) a greater potential political will in enabling people to vote more easily. Of course, the second point will be more evident when the Help American Vote Act monies dry up and new ballots still need to be designed, but I think it would be easier to make a case for election design as a priority in the US versus Europe. In Europe since a citizen votes primary for political parties (of which there may be maximum of 6 or 7) as opposed to individual candidate positions and referendums and propositions are not part of the democratic tradition, it does not seem the area of governance in which design can make a the biggest impact, beyond get out the vote efforts which are necessary everywhere. In the US, emergency and evacuation design has been precipitated by Hurricane Katrina, but already there seems to be waning interest and money for the topic outside of potential terrorism threats again. Immigration and Medical Information are all ripe for development, but seem to have no key political mandate, outside the Medical D fiasco, which is begging for a series of design solutions. As topics for Europe, the immigration process and policy seems so undefined in many ways that it would be difficult to start developing design artifacts around it. Medical and health information, environmental, and process design to support patient decision making. Because Europe's social welfare net is wider and stronger than that of the US's, the degree of government involvement in medical decision making is greater. Some anecdotal complaints from European friends (not necessarily on the trip) about access to alternative treatment options and the rationing of health services make the hospital a powerful site of goverment and citizen interaction. Whereas in the US, the hospital is often a site of insurer/citizen interaction. To improve that interaction would go a long way in building trust in the government. The redesign of the European constitution so that the average European can understand it in their own language. I am fascinated by the division and distance between "elites" and ordinary people in the discourse about European government. The constitution was designed in a way that only a lawyer could love, but there were plans to have people vote on it, a 430 page document written in legalese. I would promote a informational campaign similar to AIGA's Inequality Matters poster campaign for the UN Human Development Report. Perhaps it can be a start of a new dialogue between the European political "elites" and ordinary people that could bridge the gap of alienation that seems to be informing the rise of popularist politics in Europe. This is not to say that the US does a better job at all, but it is interesting to note in a potential transatlantic dialogue about civic design how the priorities might differ. Waiting in the Washington DC airport, I am amazed by American racial and ethnic diversity compared to Europe. Outside of Brussels, the cities I visited ( Bratislava, Hamburg, Bilbao, Warsaw) were pretty homogenous. It is a shock to see such a well represented range of peoples. Okay I did not have time to write because I spent all day wondering Brussels, first with Julie of GMF Paris Office and then with Alyssa of the group. I bought Pierre Marcolini chocolate (oh, I'm going to have so many friends over the next couple of weeks), ate an "authentic" Belgian waffle, window-shopped at African Art galleries, antique stores, and sat filling out my GMF evaluation forms at an outdoors cafe. This has been such a wonderful and enlightening experience and thank you to all who have contributed to making it so. I have fallen in love with each and every city that I visited and am excited about having people to hang out with, collaborate with, as I return to Europe again and again. I promise on Monday to do more reflective pieces before returning to the grind of my American life, but I will hope to maintain certain practices including: the Bilbao three-hour lunch discussion with friends, the EU thinking in 10 - 20 years frames for planning, the Hamburg biking to everywhere, and the Polish freedom fighting against all odds. Things are winding down. The formal aspects of the program have ended. I look forward to sleeping in tomorrow for the first time in weeks. Tomorrow I will begin a series of comparative discussions on themes like electoral systems and gender relations. Check you tomorrow am late. This afternoon we had three fascinating briefings from NATO. I must admit that the perception of NATO that you get in the US is that really of the US doing everything and Tony Blair helping out. You get no idea that there are 26 members of NATO and 20 Partners countries including Russia. It blows my mind that Russia is a partner to NATO. What made me the most happy is the discussion on Public Diplomacy with Nicola De Santis and James Synder, a US Information Officer. James Synder is not only a person in the US government who understands the power of design (including translation, plain language, etc.) but he has been advocating for changes for years. We had a great follow up after the briefing and he sent me a report he did on the challenges of Public Diplomacy. He mentions Clifford Geertz. Anyway, I am really excited about this connection because I hope it will help me to figure out how to improve goverment communications not just with American citizens (as done in the work of Design for Democracy) but with the citizens of other nations. Ideally these communications can move beyond propaganda to be open, transparent, and clear communications and processes that increase international dialogue. That would be very exciting for me to pursue in the future, perhaps not a NATO, but in some other diplomacy-oriented organization combined with my teaching. 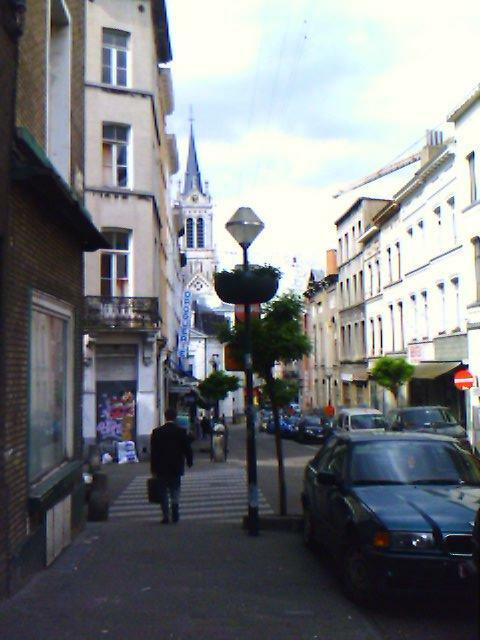 I arrived from Warsaw to Brussels yesterday. I am completely smitten with Poland. Not because it is the one country in which I could eat well as a vegetarian (smile), but becasue it has this wonderful underdog sense of history yet national pride that has not been destroyed in spite of its centuries of oppression. I have a lot of admiration for people (collectively) that have endured oppression with both their pride and their humanity in tact. It is the one trait that makes me extremely proud of African Americans as well. Brussels has been one mind-blowing discussion after another. It is partly because I am in a synthesis phase, but I feel my knowledge is growing exponentially. There is a generation of Europeans between the ages of 50 and 60 who are not perceiving the benefits of the EU because they are too young to have undergone the wars and thus appreciate the advantage of the current peace and too old to appreciate the freedom of travel of the borderless EU. The consideration of the scenario that if Turkey does meet the economic and social criteria of the EU, the Turkish people could decide to reject the EU because of its seeming hesitation. The US Federal government did not gain many of its current powers until FD Roosevelt and the New Deal, before it was limited to foreign relations and trade, monetary policy, and war. Thus the EU is stronger in its Federal "power" than the US 60-70 years ago. This is interesting if you look at the allocation of spending in the US budget and which items are pre or post New Deal items. The failure of the Dutch and French votes to accept the European Constitution have more to do with the internal politics of those countries than the actual constitution. It is tied to how "elites" propose to the people what they should do rather than gain their buy-in sooner. The fact that it was a 430-page document written in English did not help matters. I would love for a European designer to redesign the EU Constitution by transforming it to a poster/ad campaign informing people of the major points. The rejection of the EU Constitution lead to an interesting point by Robbie Ashe in our group that if the US Constitution was put to public referendum today, it probably would not pass because some would think it was too pro-gun or free speech, soft on religion. It raises an interesting question about how democractic can democracy be, when the will of the people (tyranny of the majority) can often impede social progress. EU can exert more pressure on those outside of the EU and want to join, than those already inside the EU. This will become more of an issue as more countries join the EU. There is a very funny scene in South Park's Team America movie in which Hans Blitz is convincing the North Korean president to show him the locations of his weapons. When asked what will he do if North Korea does not comply, he replies that he will write a very angry letter. The EU structure is very complicated. The book the New Practical Guide to the EU Labyrinth, 9th ed, by Daniel Gueguen should be provided to all fellows in the future before coming to Europe. EU has a common but not unified foreign policy and is involved in many arenas from Balkans, Georgia (former Russian republic), Ukraine, Belarus, and is sending missions to Congo and Darfur. There are multiple "partnership" relations with the EU which does not lead to joining the EU. These are controversal. UN and EU (and one can say NATO) all have complementary roles, but it is difficult to untangle sometimes. Today I met Kasia Szajewska, a 23 years old student, who with her friends and colleagues started an organization called Wybieram, to increase youth voting partipation. The image is a poster the group did with the help of volunteers to get youth interested in politics. They provided lists of books, music, films, and comic books tied to politics. Quotes from youth about what their issues. Quotes from local politicians. Results from a study that sociology students did on youth voting and partipation. They produced TV and radio spots aired on Polish MTV and other video shows, for $3000. I explained the election design work done by DforD, which got her very excited about doing something similar in Poland. She has received a leadership fellowship to come to the US, when we hope to plan out what could become the Polish DforD. 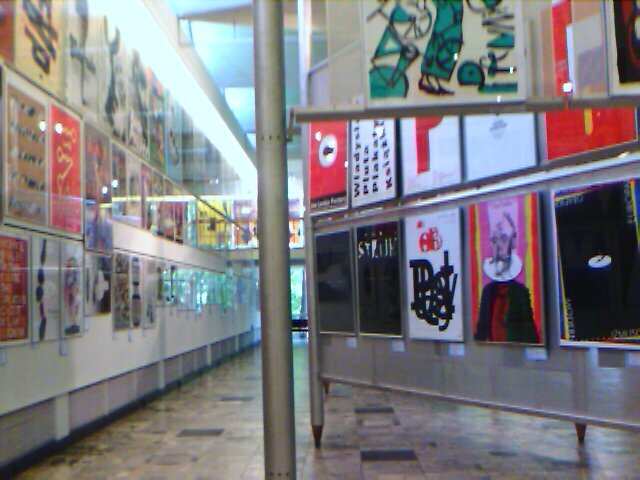 Today I visited the Polish Poster Museum. My interview uncovered one key assumption about Design for Democracy like activities: in the US there is an interest and desire of the people to trust government. . In Poland, the newness of the democratic process and the economic work that needs to happen seems to result in the desire to leave as opposed to making political life better. 1 Willing and able government partner 2 Designers with the skills and interest to do high quality civic design work. There are Polish designers doing some competition-based projects for urban furniture and city welcome signs, but it might be a challenge to find partners in the Polish government because they have other priorities. The questions are when to do it, which European country (I'd prefer somewhere in Central Europe. ), and who would sponsor it. But I believe it would be a good idea. 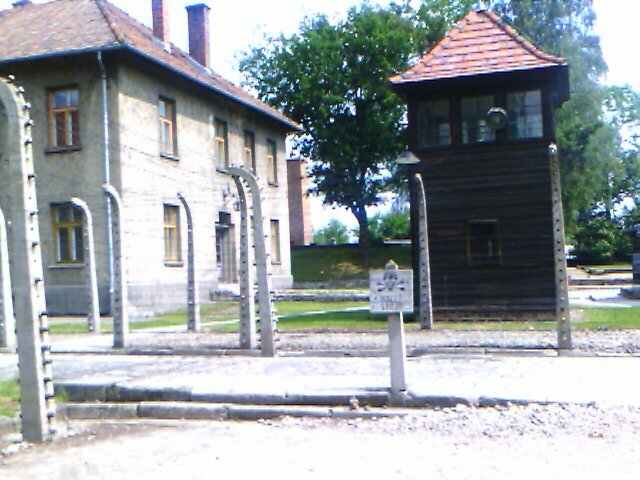 When going to a place like Auschwitz and Birkenau, the key question is what is the appropriate experience to have. At Auschwitz, people talk about breaking down and crying. But the tears didn't /wouldn't come. I felt the sort of nausea of sorrow in the face of true human tragedy, but it was all too strerile, too cerebral. I wondered, "Am I too distant from the experience? Is it because it is not my family experience?" Then we went to Birkenau. Birkenau was 8 times the size of Auschwitz. It had the crematoriums as well as gas chambers and "dying" quarters. More importantly, you are better able to imagine the guards with guns pointed in watchtowers. You can touch the beds upon which people slept. This all affected me, but the appropriate experience didn't come until we were making our way back to the car. I had walked ahead of the group to escape their chatter. They had already begun to intellectualize the experience, where I wanted to FEEL it. I began walking faster and faster towards the gate. My heart started palpitating and I couldn't breathe. I realized that I was on the verge of running All I wanted was to get out. Once out, I sat on the bench to catch my breath. Although it passed quickly, I had caught the essential feeling of the place which was the fear and the desire to escape. The great human tragedy is that while I could run out, so many did not. 1 When Poland was divided between the Austrio-Hungarian Empire, Prussia, and Russia, the Catholic Church was the unifying symbol of Polish identity. 2 During Communism, it was where the opposition could meet and thus the heart of Poland's liberation. Even now, the government has to respect for the Church by meeting with the ArchBishop or attending Church holiday events. 3 The worlc and death of Pope John Paul ll, has lead the youth back to the Catholic Church. According to the priest who guided us through the Dominican Convent, each year they accept 30 out of 50-60 applicants. The Catholic Church is important to remember when thinking about relations with Poland. Moreso, than other places we have visited.